Bonfire Night is not limited to one day for these flamboyant historians but rather a way of life. Annually, 35 Bonfire Societies, some of which can trace their origins back hundreds of years, even to before the Gunpowder Plot of 1605 take part in celebrations around Bonfire Night and particularly in recognition of the loss of life of some of their own townspeople during the Marian Persecutions of the mid 16th century. The people of the town of Lewes were incensed by the actions of Mary Tudor, Mary I of England who refused most emphatically to accept the Church of England or Protestant faith as her own and proceeded to put to death any non-catholic’s as punishment. Married to Philip II of Spain, a devout Catholic and widower, she was unstoppable. Having taken the crown from Lady Jane Grey, who only managed to keep the throne for a matter of days, she wanted to quickly and resolutely return England to Catholicism by any means necessary. By the end of 1554, the Marian Persecutions had begun in earnest and anyone found to be non-catholic was thrown into jail and kept in appalling conditions. Bearing in mind that the prisons were already packed to the rafters, the women, children and Protestant clergy were all treated disgracefully but she paid them no regard. The biggest name amongst those who persecuted the Protestants was Bishop Bonner who eventually met a richly deserved end as a prisoner of Elizabeth I. Anyone caught reading the Holy Bible, not in Latin were immediately seized. Sadly, one such group of men were having one such meeting when they were caught taking part in Bible study. They were detained and transferred to Newgate Prison in London to await the hearing. When they appeared before the courts, their fate was already sealed and sentence was passed; the four men would be burned outside the Old Star Inn in Lewes, before their friends and families to make them even more fearful than before. On 22 July 1555, Dirick Carver, John Launder, Thomas Iveson and William Veisey went to the place of execution. Dirick Carver was clutching his Bible when the executioner grabbed the bible and thew it into one of the tar barrels on the fire before the men were also dragged onto the pyre. Carver retrieved his bible and launched it into the crowd. His last words were defiantly in praise of God. The bible was hidden and remains preserved to this day in the Lewes Museum still bearing the blood of Dirick Carver. These were just a handful of the hundreds of men, women, and children who died at her hand during her reign of a mere 5 years but whilst it was literally hundreds of years ago, these souls are still remembered with an annual torchlit parade which attracts up to 80 thousand people to the area annually on 5th November. I would add that this is not a family event as there are flaming torches and barrels of tar all around but if you want to learn a little more about the historical impact of this period to all of the area, it is certainly worth adding to your bucket list. Today, whilst still remembered and acknowledged, the Bonfire Society’s main aim is to bring about forgiveness, acceptance and of course freedom to everyone whatever their religious or political standpoint. That said, the Bonfire Societies take no prisoners when it comes to their anti papism stance and indeed over the years, they have had more than a few digs at the pope and other political figures. But as the law states that the country should all be Protestants, they stand their ground that freedom of expression and the choice of which religion to follow should be a human right and not as allowed by the ruling factions. The Bonfire Night tradition started in earnest in 1606 upon the first anniversary of the foiling of the Gunpowder Plot when King James I decreed that Bonfires should be lit in every part of the country in celebration of it. Whilst Lewes may be one of the better knowns of the Bonfire Societies, there are as mentioned currently 35 of them which vary from the adult only to the family-friendly Carnival Societies. Originally there were almost 100 societies but today, wholly dependent on fundraising and local community support, this number has seen some improvement since the numbers were below 20 at one point. All of the societies have their own traditional fancy-dress theme and these are integral to the event. In fact, in some cases, if the fancy dress is not quite in meeting the requirements, the wearer may not be given the opportunity to join in the festivities. There used to be a crowd of the Lewes crowd who were Zulu warriors which had been using the theme since the mid 1940’s but they were asked a couple of years ago, in the interests of political correctness to stop this practice as it was causing offence to the dance group performing alongside them, who were all of African descent. They may instead go with green face paint instead as the message remains the same ‘express yourself safely and without retribution’. 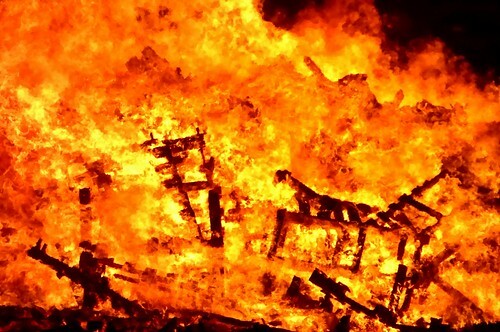 If you do live in the Sussex or Kent areas, and would be interested in joining in, get in touch with your local Bonfire Society (details are available online for anyone with a yearning to set fire to stuff) and I am sure that they would welcome the help. 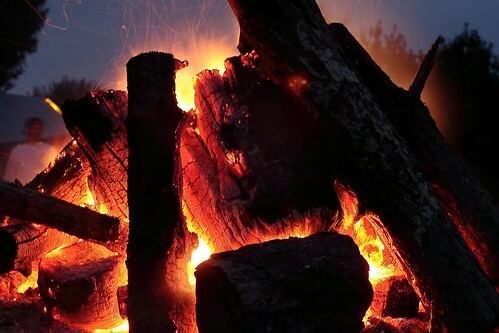 The events are planned almost on an annual rolling basis with a Bonfire Night being held almost every week from mid-September onwards but again, we recommend that you check out the Sussex and Kent Bonfire Society’s website for more details.